The first thing that pops into people’s minds when you mention Panama is its famous canal, one of the seven wonders of the modern world. However, with a diverse landscape Panama offers a wide array of adventures. Tourists have the opportunity to explore mountains and rainforests, experience both the Pacific Ocean and Caribbean Sea, and learn about the life of the indigenous population. It is a relatively Americanized country, making it one of the most safe and modern destinations in Latin America. 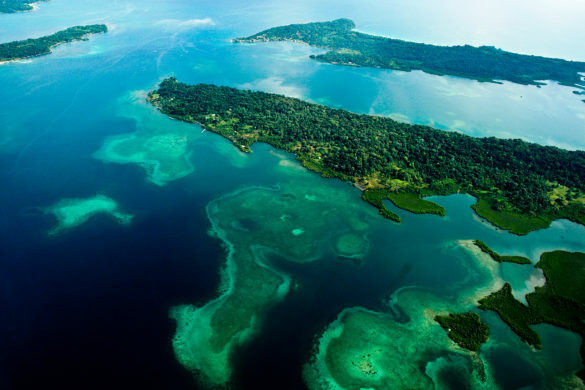 Bocas del Toro – One of Panama’s top tourist attractions. It is an archipelago consisting of nine islands located in the Caribbean Sea. Bocas offers dense rain forests with a wide range of wildlife and beautiful white-sand and blue-water beaches. The main city Bocas Town, located on Isla Colon, offers a good variety of restaurants and nightlife spots, in a laid back, bohemian atmosphere. Although Bocas mostly appeals to backpackers, it has a wide range of accommodations, from simple hostels to luxury bungalows. Water taxis that run around the clock make it easy to commute between the islands. The most common way of reaching Bocas del Toro is by bus to Almirante followed by a short boat ride, or through flying into Bocas Town from Panama City. 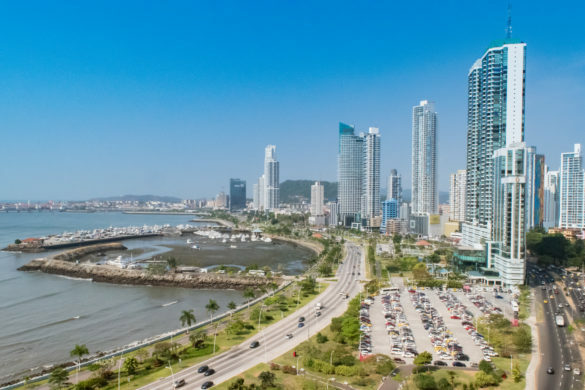 Panama City – Often referred to as the Miami of Central America, Panama City is both a vibrant cosmopolitan city and a getaway to many tropical escapes. It is a modern capital with beautiful skyline, making you wonder if you are actually in Latin America. This doubt quickly fades by visiting Casco Viejo, the charming old town, where brick roads link antique buildings and underground bars. Casco (as locals call it) has even earned the UNESCO World Heritage Status. Panama City offers a variety of day trips, such as visiting the canal, exploring rain forests, or simply relaxing on sandy beaches. San Blas Islands – Panama’s pocket of paradise. The San Blas Islands comprise of 378 islands in the Caribbean Sea, of which only 49 are inhabited. This is the perfect place to unwind and view some of the most spectacular islands and beaches you will ever encounter. The indigenous own the islands, and you live in relatively primitive conditions, with all your meals freshly caught from the sea. Apart from some of the most popular islands, the majority are not crowded. That means that if you’re looking to find your deserted paradise, visiting the San Blas Islands is a must. Santa Catalina – A small fishing village located on the Pacific Ocean. Santa Catalina is known for fishing snorkeling, scuba diving and world-class surf. Gaining popularity by tourists the last years, Santa Catalina is quickly transforming from an unknown fishing village to one of the most recommended places to visit in Panama. Boquete – A small town in the highlands of Panama and a top destination for outdoor lovers. Boquete is surrounded by mountains, gushing streams and abundant coffee farms. 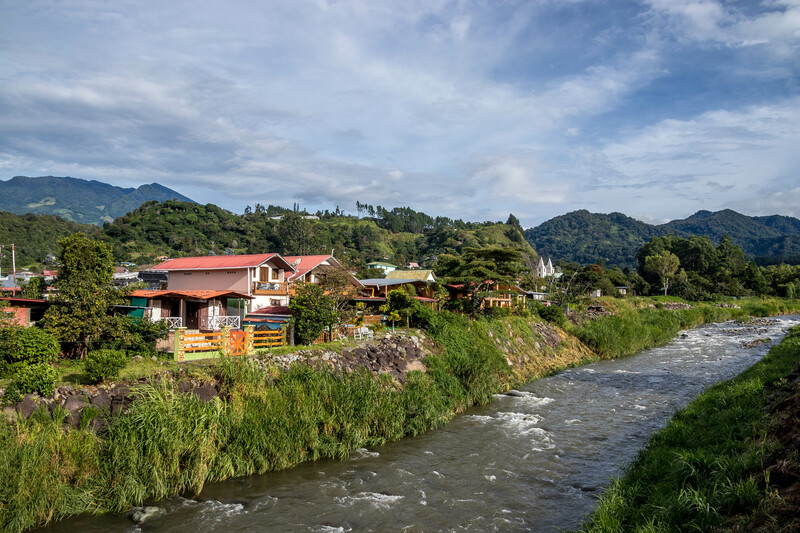 The mountain village offers plenty of activities such as hiking, climbing, white water rafting, zip lining, coffee farm tours and soaking in hot springs. Alternatively, you can just enjoy the breathtaking scenery and let your travel companions do all the adventuring. Accommodation in Panama is generally priced higher than other Central American countries. In general, the cheapest hotel rooms with cable tv and air-condition cost about 30 USD a night, while the going rate for a hostel dorm is around 10-18 USD per night. For popular hostels it is recommended to book in advance, especially during pubic holidays or during the high season of December to March. Panama has a well-maintained road infrastructure compared to other Central American countries, making it relatively easy to get around. Traveling by bus is inexpensive, and bus routes are available between most of the major destinations. Although bus services can sometimes be difficult to figure out, Panamanians are usually friendly and will be able to tell you where to wait for a particular bus – although the bus drives usually only speak Spanish. Panama City has a Metro system but with limited routes. Generally, it is recommended to use taxis or Uber as they are relatively cheap and can save you a lot of time and hassle. When to go – Panama mainly has two seasons. The months from December to March is the dry season, while the wet season is from March to December. Dry season is the peak season, mainly due to all the Europeans and Americans trying to escape freezing temperatures in their home countries. Despite the wet season not being very popular among travelers, it can be a good time to visit Panama as the prices are cheaper, and the tropical rain usually is short and evaporates quickly. Costs – Panama is one of the more expensive countries in Latin America. A low range budget starts around 35 USD, while a mid-range budget is approximately 70-150 USD. There is little visible corruption and you will get a receipt for everything you buy. You can find ATMs in all major cities and even though many places accept credit card, it is still recommended to carry cash. It is not usual to haggle at shops, but prices are often negotiable in markets, especially if you’re buying several items. Tipping – It is common to tip 10 % at restaurants. For guided tours, one would typically tip 7 – 10 USD for per person for a day tour. It is not necessary to tip taxi drivers. Food – Panamanian cuisine is a mix of Spanish, African and indigenous dishes, and ingredients, reflecting its diverse population. Recommended dishes to try are Guacho de Mariscos (Seafood Guacho), Ceviche del Mercado de Mariscos (Ceviche from the Seafood Market), Ropa Vieja y Arroz con Coco (Shredded Beef and Coconut Rice), Arroz con Guandú y Pollo Guisado (Rice and Beans with Chicken), Pargo frito (Fried Red Snapper) and Carimañolas. Regarding drinks, Panama has a good selection of beer, the country’s most popular drink. You will also find a limited selection of Chilean, U.S., and Spanish wines on most menus. Finally, make sure you try seco, a sugar-cane-distilled alcohol commonly served with milk and ice. Culture – Panama is a large melting pot of races, but in a small space. It’s common to greet in Panama with a handshake, hug, or kiss on the cheek. Panamanians are not especially touchy people, and a comfortable distance should be kept while conversing. Macho attitudes do sometimes prevail. For women travelling in Panama, whistles and catcalls are not uncommon, although easily ignored. Language – The main and official language is Spanish. Although English is spoken fluently by around 14 % of the population, it can be difficult to communicate in English outside of the main tourist areas. So brush up on your Spanish (or at least download Google translate)! Currency – Panama’s official currency is the US dollar. How did you organize your trip to San Blas Island? Did you do it ahead of your trip? We booked it from our hostel in Panama City a couple of days before the actual trip. We paid 230 USD per person for 3 days and 2 nights. That included transportation (including pickup/drop-off from Panama City), accommodation, food (3 meals per day) and 1 day-trip to the other islands. Regarding when to book I would recommend that you book in advance if you plan to do the trip to San Blas during high season. Also, if you wish to go Panama – San Blas – Cartagena then you should definitely book in advance, as it was full for the next 3-4 weeks when we were in Panama (during New Years 2016/2017).